In this post, you will learn the tips on how buy a mixer for home recording. Bear in mind that an audio mixer is most versatile audio equipment you can use. Therefore you can use a mixer in any part of your recording and mixing process. Let me give you an example on how I use a mixer before and what criteria I use to buy one. Previously, I am recording without a mixer at home and it is just awful. It is because it does not have enough amplification of signals. The signals that were directly recorded into Adobe audition is very weak and noisy. The problem that I am always facing is the difficulty of the recording process. To change instruments, I have to go at the back of the computer and unplug my cable (because my sound card before is onboard, how poor am I :)). It is just to risky sometimes I get electrocuted. For year 2008, I have a New Year resolution to buy a simple mixer at home. 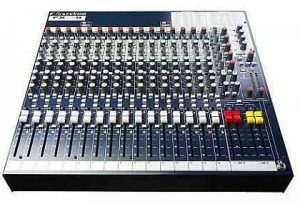 I surf the net and I found Behringer 502 5-Input Mixer . I say it is the best mixer for home at the lowest budget while achieving the best quality of sound recording. So if you asked me why did I choose Behringer Xenyx 502 in the first place and not other mixers which are big and more expensive? 1.) First, I am only looking forward to take advantage of the mixer built-in preamps. The soundcard on the computer (I am not using USB/Firewire audio interface before) cannot provide adequate amplification of recorded microphone and instrument level signals. It is an onboard soundcard for Christ sake! If I connect all my musical instruments (guitars, piano, microphone, etc) directly to the mixer first before recording it; then I can amplify the recorded signals to line level before it reaches the soundcard for recording. Then the signal is stronger than using without a mixer. 2.) I only need to record one at a time. This implies that I would only be using one or two-channels at a time when doing the recording. 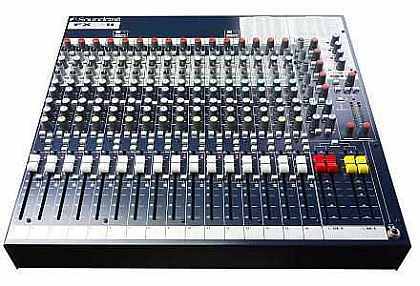 So a mixer like Behringer Xenyx 502 should fit the bill because it only have 5 channels I think. 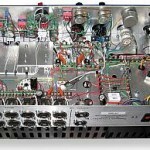 If I am going to buy big mixers, then the other inputs would not be used and I would just be wasting some money on it. Finally, I am so contented of my purchase, that I made these tips for those that are looking forward to buy a mixer for home studio use. 1. If you using a mixer before recording (such as providing pre-amplification of signals) and you are recording tracks one at time; you can buy the smallest mixer based on your budget but check for reviews on that mixer. When we go to local store we see a lot of mixers, cheap ones but not good. The sound quality is awful. The good news is that today you would not be needing a mixer anymore to do recording and perform pre-amplifcation of audio recorded signals. All you have to do is to purchase an external audio interface such as Firewire/USB type. This audio interface can work like an audio mixer and can provide good sounding preamps. Another benefit is that you can simultaneously record several tracks at once (such as those recording that requires several microphone inputs like drums). IF you are a beginner and now using a mixer you can upgrade to using an professional audio interface just like me. Before I have an external audio interface I would connect all recordings just like this (bear in mind that I am limited to recording tracks only one at a time, I cannot do multi-channel recording out of this setup like recording drums). So simple isn’t it? Bu I have a lot of problems with that setup that includes noise. 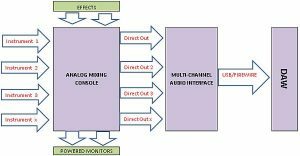 However, audio mixers are very important for implementing pre-EQ, compression and other signal processing before recording. This is commonly used in big recording studios and for home recording studios with big budget. In this case, I would recommend buying a very large mixing console with direct outputs. 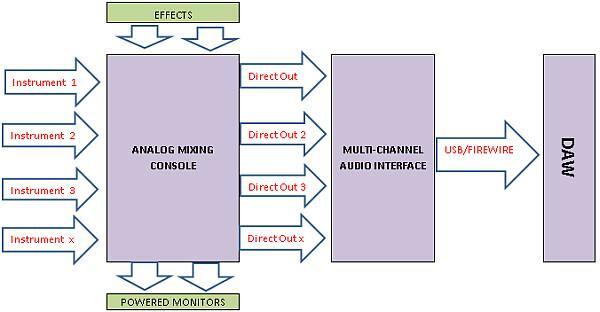 Then each channel of the mixer of has a direct outputs. These direct outputs are then connected to each of the audio interface inputs. The audio interface would simply convert analog to digital for recording to the hard drive in the DAW.